I worked with Light Power for over 2 decades, while meticulously restoring 2 Victorian brownstones in Boston’s South End. Both properties were featured in magazine articles and TV-productions. I purchased countless pieces from Tom and never, ever had a problem. His prices are fair, his merchandise the highest quality, and he’s a nice guy to work with. I can’t speak more highly of him, his products and services. Tom has my contact information and has my permission to pass it onto you, should there be any questions you’d like answered. While you don’t know me, trust me, you can’t go wrong purchasing a Light Power product. I wanted to tell you how happy I am with the light fixture I recently purchased. I would not be surprised if you occasionally get push back because of your prices. Last time my wife and I had to purchase a light fixture, there was the normal rush because we had a contractor on hand. We went to one of the larger stores in the greater Boston area, and purchased a new light fixture – one appropriate for our older home. It is nice, but it cost twice as much as the fixture you sold me to light our entry coat room, which is open to our Kitchen. The fixture is classy and perfect. Tom Powers, the proprietor, provided perfect service: he spent time showing us his inventory at his store in Boston; he then came to our house multiple times with lighting that he thought would be suitable; and my wife and I purchased many pieces that have transformed the look of our house. Tom has a great eye. Also, he doesn’t want to sell pieces that are not appropriate to their setting–there’s no pressure from him to buy; he only wants to please. I recommend him with true enthusiasm. Now that the holiday rush is over, I wanted to write and tell you how much I love the pair of sconce fixtures I purchased from you recently. They look awesome – even more handsome in person, and will make a wonderful addition to my new home. I particularly appreciate that you replaced all the wiring which will make installation easy and worry-free. Finally, thank you for the attention given to your superb packaging, as they arrived in perfect condition. I’ll be excited to send you a picture once they are installed on the wall. Thanks again, Tom. Purchasing an expensive item over the internet can be uncertain but you described everything accurately and made it a pleasure. Received the Vaseline glass light and had it put up yesterday. We absolutely love it!! It looks wonderful. Thank you for your prompt delivery. Thank you again for helping me to narrow in on some beautiful lights – you certainly are very knowledgeable! We have moved to Minnesota and the 3 lights I bought from you arrived safe and sound – thank you for the excellent packaging job. They are all installed and look wonderful in the places in the study & hallway (inverted domes), and sun room (whimsical crystal pendant). It’s beautiful! Thank you. We’ll take care of it and enjoy it for many years to come. Thank you so much for finding it and fixing it up – we love it. My ceilings are on the low side approx 9′. This Chandelier (1832ge) would be going over my dining table. Just wondering how much can the drop be adjusted. I am thinking I only need a 12″ to 18″ drop. Is this possible and will it affect the current lamp structure ? Thank you for your interest in our fixtures. Actually if you came into my shop and looked at this fixture and asked me how low you would put this fixture over a Dining room table I would say 6 feet from the floor. That would be 36 inches long which is what it is right now. Usually what you do is “establish location” and drop it down over the table. You are saying “We are meeting here at this table”. For a 9 foot ceiling, 6 feet from the floor is what I would recommend. You can still see the person opposite you, and when you are sitting, your eye level is lower so the fixture is doing it’s job lighting the table surface. There are cases where the customer is going to move the table at times or the electrical box is not over the center of the table. In those cases we put it at a height where we are saying “we are lighting the whole room”. Then, I would recommend 7 feet from the floor on a 9 foot ceiling. That would be 24 inches long. You would want a decorative fixture like this in your field of vision. I don’t think your ceilings are low. The ground floor on a Queen Anne Victorian is usually 9.5 feet. This probably originally hung in a Dining room of a Queen Anne Victorian. Just to give you a frame of reference. The door frames in your house are probably 6 foot 8 inches. Just a little above that is where your fixtures should be if you are walking under them. The answer to your original question: I can make it 18 inches and it would still work, not 12 inches. 1832GE is a great fixture. Thank you for your order. Will ship on Weds. the 20th. No problem shortening the fixture. You will have it on Thurs. We will send you the tracking number through UPS by email. Chandelier arrived in great shape. Quick question is there a particular wattage I should use for the 2 different sockets? I would use 60 watt torpedo bulbs for the down lights and you might as well do the same for the up lights. The reason for the torpedo bulbs is that they will allow you to take the shades off over the bulb. I would use clear bulbs. Looks great thanks for help. I discovered your website this weekend. What a fantastic collection you have! The photo you see shows the entry of my 1917 Prairie Foursquare in Texas. 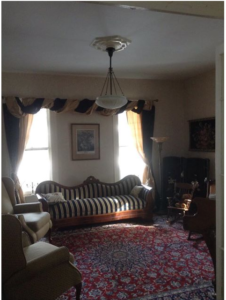 The original Colonial Revival sconces remain, but I am looking for a suitable pendant for this space that will mix well with the scones and architectural details(pictured is a stand in for the 80’s chandelier that was there) Dimensions of the entry are approximately 21′ long x 16′ wide with a 10′ ceiling. Your 24″ Arts and Crafts Bowl is a great size but is it the best stylistically? What else do you recommend? Thank you for your photos. What a beautiful Foyer. I guess what I would say is if you want to continue with the kind of detail that you have used in the lighting and the Secretary you may want to go with something Classical or Neo-classical like item (788L-G)Cast Bronze Lantern w/ Rams Heads. Please click on (1992d)Large Arts & Crafts Leaded Glass Inverted Domes. if you want the Foyer to look less Classical. You have a great house with a lot of character but you could design either way. I think leaded glass would look good in that Foyer. It seems that what you have done is somewhat understated with a little detail topping it off. The leaded glass dome is definitely in the period. It is not so Arts and Crafts that it would conflict with what you have already done. My thinking lines up with yours on the leaded glass fixture, your item 1992D. That was my first impulse, but I wanted your specialist advice. Should I complete the purchase via your website? Yes, I think the 1992d Arts and Crafts fixture will look really great in the Foyer. I think it will work very well with the existing details that you have. It does look like a really great house. I can understand your feeling about being Stewards of the property as well as owners. You can go to the 1992d item page and click on the “purchase this antique” button. It will ask you for all the information we will need to safely get the fixture to you. I think the length is just right for a 10 foot ceiling. We are having a 25% off sale with free shipping so the form that you fill out when you buy the fixture will reflect that discount. It will be $3187.00 net. We ship UPS Ground and we will email you with the tracking number of the package through UPS. We will ship on Friday the 15th. This package will be a 30″ cube box. The package will be double boxed. The interior box is a 24″ cube. The shade will be wrapped in 4 courses of heavy bubble wrap. The two boxes will be separated with three inches of peanuts on all sides. We have found that this is the safest way to ship a fixture like this one. Of course it will be insured to the full value. Our goal is to make sure that your fixture gets to you safely. Hi Tom, the fixtures are up and look beautiful. This lighting is beautiful!! Really unique pieces Tom. Thanks. The fixture arrived safely. We look forward to hanging it and enjoying its beauty. Best..
Light just arrived. It Looks Terrific! So it’ll be hanging in the house of a 19th century Sea Captain. Thanks for all the patience and effort. It really looks great and I’m very pleased with it. They are coming to hang the fixtures today. Exciting! They are already the center of talk…great advertising for you! What kind of patina on your Holophane flush light? Could it possibly go with a dark antique pewter? (1684f)Holophane Tear Drop Flush Fixture and (1687f)Signed ” Holophane ” Flush Fixture‬ have the same finish. It is like the finish on the arts and crafts lantern you bought. It is a bronze patina. I know it can work with nickel and silver. I think it could work with a dark antique pewter. Is there any possibility that we could talk by phone today? I realize it’s Sunday, and I do apologize for asking. The issue is that I’m flying overseas at 4 p.m. AZ time for 10 days and it will be very difficult to place an order after my departure. I’m hoping to obtain your suggestion on a gas harp or J with a 16″ max drop (those 8 foot ceilings strike again), as well as the Halo flush light. Also need to discuss a sconce for the hallway. Same project btw…..The lights are a huge hit…. Would need to have them delivered by the 12th…. I know….I’m a pain…Sorry! No your not a pain. Call me any time today. No problem delivering them by the 12th. Made it to Prague. Snowing! Need to make it to meetings, but wanted to say how much I appreciate, once again, your professionalism, expertise, and helpfulness re the lighting. Thank you for sending so quickly.. Yes the fixtures arrived safely. Thank you. I am remodeling my library and plan to use them there. One of these days if I ever finish a project I hope to send some photos of my home. The lighting fixtures I purchased from you have really added to the unique look I was striving for. Thanks for asking. Everything arrived safely with no broken pieces. I love the lights! They are really cool. The “new” light arrived in fine shape, expertly packed and protected. I am sending two emails to you, each with two photos of the installation. At least for now, I ended up using the original canopy (5″ x 1″)to have enough room for the wires.I have the one you sent me flat up against it, and it actually looks like a single, elegant canopy. I have the pendant illuminated by two 60-watt “ceiling fan” bulbs which provide enough light to illuminate the stairwell. It looks like a jewel, easily integrating with our eclectic interior. We both really love it. Thanks so much! UPS delivered the light and sconces yesterday and all is fine. You did a world-class job at packing the lights. I was worried about how one could send that light from Boston to here without it getting damaged – but you did it ! We got the light up this morning and it looks like it has been there for a hundred years. It is perfect. Thanks for your help. We’re working on another room ( library ) and will be looking for another light in a month or two. Be back in touch then. We live in an 1890 Victorian three (3) story townhouse in VA that we have renovated over the last several years. I had looked for period lighting sources for some time and was very pleased to find the knowledgeable and friendly folks at Light Power. We could not have been happier with the dining room chandelier we purchased. In fact we were so pleased we went back and bought four wall sconces of the same vintage and which coordinated perfectly with the chandelier. Thomas was patient and offered great advice. Everyone is impressed with the quality and condition of these great fixtures. Hi Tom, The light fixtures arrived on-time and in excellent condition… and installation went smoothly as well. They are truly stunning. Tom- We are really enjoying the new hall light and continue to get compliments on our light fixtures. Tom- Everything arrived alright. Thanks so much. The lights look great. Tom- It’s a great addition to my house. Thanks. Tom, The chandelier arrived today and it is stunning, I couldn’t be happier with it. Hi Tom- I’ve been meaning to email you since last week… my client loves the light fixture! It was the perfect fit for her custom closet. Thanks so much for shipping it a little later. The length ended up being just perfect the way you shipped it. Tom, Just to let you know I’ve received the lights today! Picture does not do it justice – just absolutely love them. I’m contemplating now putting them up in the library as someone took the original ones. All I have are knob and tube wires hanging out of the plaster above the fireplace. Shipment is in and fixtures look great. Just a quick note to say that the chandelier arrived today and looks fantastic! My electrician is suppose to stop by tomorrow to take a look at it and set a time to install it. Thanks for such a tasteful holiday greeting..tho I think the snowman a bit too cutesy for the beauty of what follows. The chandelier which I purchased from you in August… thanks to your great sale…is so absolutely perfect I sometimes find myself literally entranced by it. I continue to be appreciative of the guidance you gave me re shades and height. I doubt that I’ll be looking for another period lighting fixture notwithstanding my plans to restore another old wreck but keep me on your mailing list nonetheless. We absolutely love the new dome fixture! The proportions and detail are perfect for the entry. We also moved the smaller dome to it’s new location at the base of the stairs and it looks lovely in it’s new location. We discovered when hanging the two, that because of the dimension difference, the smaller dome hangs lower, and we would like to shorten the length on it, rather than extend the larger dome. Since you can see both at the same time, we need to have the length as close as possible. If there must be a difference, the smaller dome should be higher/shorter. We’re wondering if we should get shorter rods from you, send it to you to alter, take it somewhere locally..what would you recommend? Thanks for your assistance, and for wonderful lights! I got your email, I am not at my cabin but as soon as I get back I’ll send you pictures of the lights I’ve ordered from you. They look fantastic and when things slow down I want to order a couple of more. I’ll email you the pictures in the next couple of weeks. received the gas harp yesterday…just as you had promised. second of all: the lamp: HOLY CRAP!!!!!!!!!! (sorry…but it is awesome!!!!) the shade is sooooo beautiful…the pictures you took were great…but in real life: just perfect!!!!!! i cant wait to hang it!!! only thing is that the contractor raised the floor a bit more than i expected…so im hoping that the length at 24″ will clear my 6’5″ dad (he is the barometer for chandelier heights)…ill see how we fair when i go to hang it or i may have to shorten it just a hair. what a wonderful transaction we had with you….thanks, thanks, thanks!! Everything looks great – thanks so much ! Hi Tom. I got the fixture, and it is beautiful! I haven’t yet had it installed, so I don’t know what it “really” looks like, but I think it’s going to add a lovely touch to my kitchen. Thank you again for all your help to make it work for me. I’m sure I’ll be shopping more with you as we go through the whole house. Cheers! Tom: Received the boxes yesterday. Got it all put together, I love it. Will be a perfect compliment to our house. Thanks!!! We had a great experience shopping and working with you. Your Antique Lights and Service set you apart from other Antique Lighting Showrooms. Dear Tom– The fixtures we bought from you and your partner were installed last Thursday and they LOOK GREAT!!! I just saw them for the first time today. That silver Arts & Crafts chandelier was meant to be in the dining room of this 1906 shingle-style cottage. It looks perfect! You should see its golden Steuben shades with the pink and gold of the sunset over the Long Island Sound’s blue-grey waters behind it. Just fantastic. The sunset also shines through the wall sconces’ golden shades so they turned out really well too. We now have a knock-out dining room with a beautiful fixture backed by a spectacular view of the water. We installed the the oiled bronze fixture with the pulled-feather shades in the music room. It is also fabulous because its curvy design and colors are similar to the cottage’s original stained-glass window behind it. We shortened the stairway fixture a bit and it looks simple and unobtrusive and will be much easier to navigate for bulb changes than the prior new flush fixture. Thanks again for your help and for letting me know when your prior customer returned that silver fixture. I’m so glad she “knew” it was meant to be here in Sea Cliff in this old house! Best regards, V. & H. B. We have a medieval revival home built in 1917 and we were trying to find authentic, antique lighting fixtures from the same time period. We needed two fixtures that would co-ordinate because both were in the same room – one over the kitchen island and the other over the table. Collaborating with you was a pleasure and we found what we were looking for. The quality and quantity of your fixtures sets you apart from other Antique Lighting Showrooms as well as your excellent web site and quick responses. I needed distinctive vintage pieces. I would like to see some more basic (and lower priced) antique fixtures to round off your selection? Love your collection! I really like the personal service I have received. I was able to trade in a fixture that I could no longer use and apply it towards one I was able to use in my new house. I really appreciated being able to do that. I have purchased eight fixtures from your store. At first I lived in a condo with 10 foot high ceilings. Now I live in a house with 7.5 foot ceilings. The challenge has been to incorporate my old lighting into new surroundings and purchase new lighting that doesn’t hang quite so low. I love that you are on the internet now and that I can preview new inventory before it goes up online to the world at large. Your inventory sets you apart from other Antique lighting dealers. I am pleased with the results of our collaboration. I would have liked to have known the provenance of my two fixtures – old and expensive. Your selection, and an easy Showroom to visit and see groups of lights, sets Light Power apart from other antique lighting dealers. I was facing the challenge of finding enough sconces ( at least hi-end ones) in good shape and I found what I needed in your showroom. Your collection is far more extensive than others we looked at. Once we purchased our fixtures, the service was outstanding – including taking back one of the fixtures to correct the length. Keep doing what you do. The quality of your work and product sets you apart from other antique lighting dealers. Your very impressive Website and showing of prices for your inventory is a big reason for visiting your Showroom in the South End. We love our Antique Lights – they were expensive but wonderful and we are very pleased to have worked with you. You are terrific – wishing you all the Best. I had to write and thank you for such a beautiful light fixture. I already had it installed and want to keep it on 24 hours a day. It has really ” made ” the bedroom. I will definitely keep your shop in mind for further lighting needs. We deal in American Federal Furniture and I would suggest to my customers looking for lighting to go to your Website. You have a great site. We really appreciate the sizes and prices. We were pleased to be working with you. Please keep us on your e-mail updates. Tom – Given the unusual nature of my visit and needs, I was completely satisfied with your services and supporting attitude. Thanks for overcoming your initial distrust and for opening your door to us. Your interest and support to your customers are wonderful. And your prices are better than elsewhere. You’ve got a great selection of lighting. After being in your store we now look at your Website regularly. You have been a great help to us – literally making home visits – and we love the lights. To call the elegantly designed inverted dome we just hung in our dining room a light fixture would not do it justice. This is a work of art! Your assistance and advise proved invaluable in selecting the appropriate design and dimensions for our room. You really know your stuff! Each time we pass by our new dining room we pause for a minute to savor the artistry of this timeless piece. They just don’t make them like this anymore! Thanks. Your quality of service, range and quality of lights set you apart from other Antique Lighting dealers. Your Website was very useful and your service excellent. We are very pleased with the resuls of our collaboration. Your Website was a big reason for coming by. You have clear pictures of the items and great descriptions. Collaborating with you was a pleasure. We love our light fixture and everyone who sees it also loves it. You also provide great service. You have a good Website that comes up near the front and is easy to review clear pictures. I wanted pre- 1900’s Gas Lights . Your customer service, selection of Antique Light Fixtures and pricing set you apart from other Lighting dealers. Seeing your fixtures at a friends home motivated me to come by. My house was built in the late 1800’s. Because it was an older home I wanted my Lighting to stay within the period of the house. Yes! I am pleased with the results of our collaboration. I suggest you have table lamps to improve your service. Selection and personal service sets Light Power apart from other antique lighting dealers. We needed lights from the right period – lots of old electrical and we were very pleased to work with you. Combining tastes with the style of my house was a challenge. Your selection was wonderful and the customer service was excellent. I am pleased with our collaboration. The ease and layout of your website sets you apart from other antique lighting dealers. Finding period lighting in the style and sizes for our Design and Consulting project was a challenge. Working with you was a pleasure. You guys are great. I am very happy with my purchase. Your selection of inventory set you apart from other antique lighting dealers. The only challenge I had was that I live in California and your are in Boston. You answered my questions and the merchandise arrived in a timely manner. A suggestion to improve your service would be to make it easier to find all of the pieces in the packing material when shipping. Your unique inventory, antiques, set you apart from other antique lighting dealers. Finding a one-of-a-kind “special” item was the lighting challenge I was facing. I was pleased to work with you and I appreciated the excellent service and flexible return policy . Unfortunately, the chandelier we purchased did not work out. We were very pleased with our collaboration. I was looking for something suitable for a dining table and you had what I needed. You have a good inventory of lights at very competitive prices. Just keep doing what you’re doing. I would do business with you again. You have a great selection and great service which sets you apart from other Antique Lighting dealers. Finding the quality and style to match our new ” old house look and feel ” was our lighting challenge. It has been a pleasure doing business with you and I am very pleased with our collaboration. You have updated inventory, straight forward price flexibility, quality photos and occasional email updates which set you apart from other Antique Lighting Dealers. The lighting challenges that we faced were acquiring a typical fixtures between 1850 – 1905. I am pleased with our collaboration. Tom, you have a great Web site and friendly service. You are set apart from other antique lighting dealers by your selection, honesty and integrity. I was absolutely(100%) pleased with the results of our collaboration. You have very interesting Lights and a willingness to devote time for discussion. You gave friendly individual attention and I am very pleased with our collaboration. The suggestion I would have to improve your service would be to take more credit cards i.e. AMEX ! You have better prices and quicker repair service than other antique lighting dealers. We needed lights that fit the decor of our 1866 townhouse and needed lots of restoration on our old fixtures. We were very pleased with our collaboration. As far as improving your service, a wider inventory is always appreciated and your showroom could be more organized. We needed Antique wall sconces and flush ceiling lights. We found what we needed and found shopping at your store to be a true (de)light. The challenge I was facing was finding interesting and usable period lighting. You have a good selection of period lighting with an easy to use Website and great service. Yes ! I am pleased with the results of our collaboration. Tom’s personal service and friendliness sets Light Power apart from other antique lighting dealers. We have a 100 year old home and were looking for old style fixtures that gave modern illumination. I am pleased with our collaboration and recommend you to others. We felt as if we were working as a team with you. You have gone above and beyond for us – shipping free of charge and ahead of schedule. You have opened the shop for us and stayed open late – we really appreciate it ! We are restoring a 1720 Victorian Home and 90% of the lighting needed to be replaced. We are extremely satisfied with the results of our collaboration. You have been so helpful and friendly and are so pleased with all of the lighting that you have restored for us! Thank you ! You have a great Website and quick e-mail responses which sets you apart from other antique lighting dealers. I am still facing lighting challenges. I need 6 sconces for a great room that is 30′ tall, a dining room chandelier, a light over a work kitchen island and matching lights over a desk. I am pleased with our collaboration. Your service is very good and it would be helpful to also list the size of shades for reference. The overall experience dealing with you was very much a pleasure. Looking for period correct lighting was a challenge for us because we have nothing available locally. We are very pleased with our collaboration with you. Service was great and we have no suggestions. Light Power was helpful, knowledgeable and had a good selection. We needed to replace a fixture with one in keeping with the age of our house. We were very pleased with the collaboration. I didn’t contact any other Antique Dealers – I knew you would have what I wanted. I had small rooms, not too elegant – but I wanted unusual fixtures. I am pleased with the results of our collaboration. All restoration and finishing were perfect on each piece. We found something we wanted online, ordered it, and it arrived and met our expectations. We really didn’t collaborate – We selected, ordered and successfully received a great light. I would suggest that you remove sold lights from the Web. It is frustrating what one can not have. The light we purchased is great. Thanks. Personal attention and beautiful fixtures set you apart from other Antique lighting dealers. I needed Period ( Victorian ) lighting and I am please with our collaboration. Thank you for your letter. I have been very pleased with your service – my only complaint is that you are in Boston instead of New York ! Everything about our exchange was terrific – I love my light fixtures, and can’t wait to get them installed in my apartment. The prices were very reasonable, I can tell from comparing your rewiring to some other fixtures I purchased in a thrift shop that you took a great deal of care and that my contractor will have no problems with them. In addition, your willingness to credit my account for a fixture I decided I couldn’t use and your assistance in storing my fixtures until I needed them were really helpful to me and much appreciated. I only wish you were here to put these other fixtures in shape for me ! It is hard to say what set you apart from other antique lighting dealers. I needed beaded basket shades – the sort that go right up against the ceiling and not too expensive. I am pleased with our collaboration. I would suggest that you have more chandeliers and sconces that are combination of Black and Gold – Swedish ( light in feeling ) unusual. Lots of old lamp shades of all sizes would be good for you to have. Great service and I love the merchandise. I am absolutely pleased with the results of our collaboration. Tom gave great suggestions as to how I could keep the integrity of the fixture while giving it a fresh modern look for my loft space. I had an important family piece that needed to fit into my modern apartment. I am absolutely pleased with my collaboration with Tom. Everyone comments on this light and I tell them to visit your location. and I like the “ trade-in “ policy. Light Power is set part from other antique lighting dealers by their Web Site selection and their convenient location in Boston. We have an 1885 Downtown D.C. Townhouse with a formal entry, vestibule and hallway that needed appropriate lighting. We are very pleased with our collaboration and we will be back when we are ready to do more renovation. The personal service and great selection of period lighting set light Power apart from other Antique Lighting Dealers. We faced the challenge of finding lights for various interior locations in our 150 year old house. We are very pleased with the results of our collaboration ! Personalized service with a laid back attitude sets Light Power apart from other antique lighting dealers. I needed lights for my entire house. I am extremely pleased and would recommend Light Power to people i know who were looking for Antique lighting. I’m very happy with the service I received and happy with the quality and quantity of inventory. Plus, you let me bring the dog into the showroom ! You are set apart from other antique lighting dealers by your selection, and more importantly, your outgoing and gregarious nature. We faced the challenges of undoing the ” Home Depoting” of a hundred year old house, and replacing the fixtures with something with class and character. I was very please with the results of my collaboration with Light Power. Excellent service sets you apart from other Antique Lighting dealers. We were delighted with our purchase. The lights are beautiful and very unique. We have not seen lights so elegant from any other source and your service is exceptional. We have an 1876 farm house and all of our furniture are antiques. Thanks also for the excellent packaging. It is obvious that you take extraordinary efforts to satisfy your customers. You have a great selection with great service and good value. I am very pleased with the results of my collaboration with you. I faced the challenge of finding the right size and style wall sconce for above my mantel. I felt you were knowledgeable, honest, and had a very helpful attitude, all of which makes me want to come back. I was very pleased with our collaboration. Personal service , great advice and interesting fixtures set Light Power apart from other antique lighting dealers. We wanted to incorporate fixtures in a new renovation to a Victorian house. We were very pleased with the collaboration with Tom. The service was great and it was amazing how Tom remembered us and our house even when we haven’t visited Light Power in many months. D. O. & D. P.
Your showroom, tucked away near Albany St, is truly a magical place, with so many beautiful old lights hanging from the ceiling. ” Please ” is too mild a word to describe my feelings about Light Power – ” thrilled – more accurately describes my reaction to your service. You are courteous , friendly and was willing to repair my chandelier quickly so i would have it in time for Christmas. We had to find a “period” sconce for an historic home that had a very limiting location. We were able to find one at Light Power and you adjusted it just enough to allow success. Light Power is set apart from other Antique Lighting dealers by being : customer friendly, available to meet us at our convenience and by having a quick turn around time. We are very pleased with the collaboration. Human contact set Light Power apart from other antique lighting dealers. I am totally pleased working with Light Power. Personal Service and Tom’s recommendations set Light Power apart from other Antique Lighting dealers. We fell in love with a very expensive fixture that was too big for our room. Tom was able to suggest another Antique Light that would be a better fit. We are very pleased with the collaboration with Light Power. One way Light Power is set apart from other antique lighting dealers is their Website. Genuineantiquelighting.com is easy to navigate, and has good options and is consistently updating. We replaced a new light with an Antique Light and are very pleased with the collaboration. Tom’s personalized service and speedy turn around set him apart from other antique lighting dealers. I needed simple, classic selections.. and many !! I am very please with the collaboration with Light Power. I was facing budget limitations and was very pleased with the collaboration. Light Power has a terrific variety of periods and styles, at prices much better than other Antique lighting Dealers. The prices are usually better than a modern reproduction. Finding Gas era Lighting for Victorian Houses Circa 1850 – 1875, are a period that many Dealers are weak in. I have referred many friends and business customers who have found just what they were looking for. Your service is great – just keep at it ! We needed to repair a 100 year old fixture (?) and two sconces and were very pleased with your work. I liked your fixtures in a magazine ad , called the ad and reached you on the phone. You were immediately encouraging that you could help me find what I needed to hang over my Kitchen Island. I’ve been in Antique shops from Boston to D.C. on this project and I contacted many throughout the internet . I did not reach anyone else that felt they could supply what I wanted. Everything was smooth, packaging was excellent, photos on the internet were great representations. I saw you in the yellow pages and needed a chandelier rewired. I was very pleased with our collaboration. Your service was just what I needed. You are set apart from other antique lighting dealers with more selection and better prices. You have a great display and wide selection of Antique Lights. You were very helpful. Thank you. Your inventory is always superb and I usually can not leave your shop without a purchase ! You always take the time to help me fit the correct light, in the correct spot. We know, that you know, what you are talking about ! You were very nice, helpful and had just what I wanted. You didn’t make my request seem insignificant. We were looking for authentic antique lighting and not just reproduction. Once we came in to see for ourselves what you had, we were hooked ! The specialty items and the ever changing inventory keep us coming back ! Color and vaulted ceilings were our main challenge. You helped us with both. You always do whatever we dream ! The personal attention, quick understanding of my taste, high quality inventory, and reasonable prices set you apart from other antique lighting dealers. Tom is what sets Light Power apart from other antique lighting dealers. I have an old house with no original lighting. I was looking for fixtures that fit the mood of each room as they are restored. I love my dining/pool room light and the hallway light that I recently purchased. Light Power has great service and authentic antique lighting with clean elegant designs. Light Power is different from other antique lighting dealers because of their unique inventory and unique ability. I am pleased with the results of my collaboration with them. I’ve renovated four houses and always find I’m coming back to Light Power to fill our lighting needs at each property…Tom always has a large enough inventory to select from, quality products and reasonable prices. He’s a pleasure to work with. Tom always has a large and varying inventory of lighting fixtures in a fun place to browse. He obviously loves the business and is always willing to spend the time discussing our needs. He has great advice and never tries to sell us something we are not happy with…. Light Power always comes up with what we need. At Light Power you will find great service, wonderful people, and an amazing selection of high quality fixtures . We found multiple pieces and pieces that fit with the style of our house. We love coming here and always leave with lights we love !